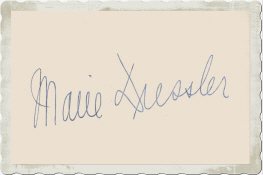 Marie Dressler already went the a theater group at the age of 14 and soon was successful as a Vaudeville comedienne. When she played on Broadway in 1892 she took the city by storm and continued the success into the new century. In 1909 she impersonated the charactoer of Tillie at the theater for the first time. It didn't last long and she made her film debut with this figure. She made her film debut with "Tillie's Punctured Romance" (14) at young Charles Chaplin's and Mabel Normand side. The movie was a great success at the first go and it follwoed other Tillie movies called "Tillie's Tomato Surprise" (15) and "Tillie Wakes Up" (17). She also took part in other movies like "The Scrub Lady" (17), "The Agonies of Agnes" (18) and "The Red Cross Nurse" (18), but after that she vanished completely from the screen for nearly ten years. One reason of her long absence was her efforts for the so-called "chorus girls' strike" in 1917 and thus opposed against the producers. The dispute ended with a triumph of the chorus girls and led to the foundation of the "Actor's Equity Union". The price which Marie Dressler had to pay for her engagement was a banishment from the theater and the film business by the producers. Only in 1927 she was able to make her comeback in the movie "The Joy Girl" (27) thanks to director Allan Dwan. The screenwriter Frances Marion wrote the movie "The Callahans and the Murphys" (27) which was made for Marie Dressler. It followed the movies "Bringing Up Father" (28), "The Patsy" (28) and "The Divine Lady" (29) before took up the challange of the talkies. The 30's marked an unexpected height in her career. She laid the foundation of her late career with the movie "Dangerous Females" (29) together with her former colleague Polly Moran. The movie was so successful that eight other adaptions followed like "Caught Short" (30), "Reducing" (30), "Politics" (31) and "Prosperity" (32) . The movies with Polly Moran were a mixture of comiedies and tragedies but with her role in "Anna Christie" (30) at Greta Garbo's side set a new milestone as a character actress. It followed highlights like "One Romantic Night" (30), "Min and Bill" (30) - for which she got an Oscar for the best leading role, "The March of Time" (30), "The Girl Said No" (30) and finally "Emma" (32) - for which she was nominated for an Oscar too. Nothing seemed to be able to stop her career but than she got the diagnosis that she had cancer. She fought several years against the illness and even took part in more movies despite her pains. Her last movies were "Tugboat Annie" (33), "Dinner at Eight" (33) and "Christopher Bean" (33) before she was finally defeated by cancer.